There are so many reasons for wanting to make an extra $2000 per month. The greatest of all is to suddenly get the urge to want to make free money! The Internet is an incredible place with so many tools, apps, and websites that you can take advantage of in your quest for extra cash. The only ways for companies to improve their sales and market their products better is by knowing what people want. It can be a lot of effort for a large company to go about asking people what they think then analyzing data. Services like SurveyJunkie do it for them. These services offer online surveys and collect their data to larger companies. Companies can then use this data to their advantage. Naturally, SurveyJunkie gets paid and so will you! The website will pay you money for each survey you take. It’s one of the best ways to make free money online today. Most surveys on SurveyJunkie pay between $0.50 and $1.25 which is great considering that most of these take less than 5 minutes to complete. This is particularly great if you spend a lot of time at home feeling bored. Sign up now and make free money online with SurveyJunkie! PointClub is a similar service to SurveyJunkie. With PointClub, you collect points that you can then exchange for dollars or gift cards. 1,000 points are worth $1. Each survey you take could earn you between 200 to 2,000 points. So the maximum you can make per survey is $2. The duration of surveys vary but they can often be a little time consuming. It’s not much but if you take enough surveys, you could end up making a decent amount of money. Join PointClub and get started with surveys now! Investing isn’t easy by any means. It’s also quite scary when you think how much loss a bad investment can cause to your savings and finances. Apps like Acorns were created to make your life much simpler and to boost your earnings through investment. Connect your bank account to the app and it’ll invest the money you save for you. It does this in a simple yet safe and efficient way to ensure that you don’t lose your money. The app uses spare change in your account. It rounds it up then invests it. It does so in a way that you won’t even notice. Let’s say you buy a burger for $4.73, the app will then take 27 cents out of your account and set it aside for investment. Basically it’ll be as if you spent $5 on that sandwich. Investing your money is definitely one of the best ways to increase your income and overall financial status. It’s an incredible way to make free money from home. Register with Acorns now and start investing! Photography is everyone’s hobby these days, but not everyone makes money through it. Professional cameras may be expensive, but they’re quite profitable on the long run if you want them to be. There are numerous websites online where you can post the pictures you take. People can then download your pictures by paying a few dollars. If you already have hundreds of pictures on your hard drive, just upload them and make free money online. Whether you want to go shopping at stores or prefer to do it online, you’ll be able to get some of the money you spend back. There’s no more convenient way to make free money. Plenty of apps exist to earn you some of your cash back just by uploading a picture of your receipt to the app. Ibotta is a prime example. Get started with Ibotta here! Another app that can provide you not just with cash back, but also with coupons and discounts is Ebates. Just know that Ebates doesn’t support all products so you might want to check to see what they’re affiliated with before going shopping. Receive your money back and get discounts with Ebates! Writing is a really popular way to make money online these days. You could write as a freelancer, by joining a company, or even create your own blog. If you spend a couple of hours each day writing, you could earn those extra $2000 you want. It might take a while to get started with freelancing as you build a reputation. Blogs take some time too. As soon as you build a reputation or a fan base though, it’ll get much easier. For those who love writing and think of it as a hobby, consider this a way to earn money online free, fast, and easy. Well, not all of us are gifted in the same fields so we’re not all amazing writers. Not being able to write doesn’t mean you can’t make money off of the English language. You can still proofread! You can make up to 20 thousand dollars per year just by working as a proofreader. Just like with writing, it’ll take some time to get started as people start to trust your abilities. It’ll be worth it though when you’re making so much money by working part time and doing something so simple. Are you into the world of fashion and cosmetics? If you are, then this should definitely interest you. As you probably know, it’s not too hard to join Avon’s network of representatives and salespeople. What’s interesting is that you can recruit people to your network and supervise them. With each sale they make, you get a portion of the money. Join Avon’s rep network now and start making money! Whether you want an extra 2000 dollars every single month or just as a onetime thing, renting extra rooms at home should help you make the money. Airbnb is a great app for you to do this through, especially if you don’t really want a roommate or someone to stay for a very long period of time. Sign up for Airbnb and post the room on the website. You’ll definitely get rent offers that meet your set price. Airbnb is especially great for those looking for someone to stay for a maximum of a month or so. Just make sure to be a great host and keep your place clean and cozy. As renters start to come and go, they’ll leave reviews. In order to keep people coming and be able to raise your price a bit, you’ll want to keep reviews positive and encouraging for potential renters. Alternatively, if you want to rent a room for an extended period of time, like a year or so, you could post an ad in the newspaper or websites like Craigslist. Join Airbnb to meet new people and make more money by renting out vacant rooms. What’s the point in keeping all of your old DVDs, CDs, and books? Your old stuff just takes up space and it’s very unlikely you’ll need to use it again. If you’ve had something lying around for 3 years, but haven’t used it once during that time, why not sell it? Consider it a way of cleaning up, and you get to make free money online fast. This can be done in the easiest of ways by joining Decluttr. You can probably tell from the name, this app will help you get rid of any clutter lying around and will even earn you money in the process. Sell your old stuff with Decluttr now! Admit it, you probably spend a whole lot of time on the Internet doing nothing useful. We know because we do that too. The worst thing is that when you think about it, time you spend on the Internet could be used to make extra money. You could’ve started a blog, took some online surveys, or did any number of things. Well, with Swagbucks your days of regret are over. Once you join Swagbucks, you’ll be able to get gift cards for doing simple tasks online like taking surveys, watching videos, and even shopping. It’s a wonderful service and one that’s particularly useful considering how much time we aimlessly spend online. You also get a $5 bonus just for signing up. Get started with Swagbucks and receive gift cards for doing the simplest tasks online! We’re not talking about spending hundreds of hours playing a game to make a few cents. We’re here to discuss the Long Game Savings app. Connect your bank account to the app and it’ll take care of the rest. Every time you side aside money in your savings account, the app will know (since it’s connected to your bank account). It will then unlock games for you to play. To be clear though, these games aren’t based on skill or concentration, they’re games of luck. Nonetheless, if you win these games, you’ll receive money as a reward. If this doesn’t qualify as a way to make free money online then I don’t know what does. Connect to the Long Game Savings app and start winning money. Are you good at tracking time, setting schedules, and creating to-do lists? If the answer is yes, you should definitely consider becoming a virtual assistant. You won’t even need to do this full time or in person. The Internet makes everything much easier and more convenient. Try to find an opening for a virtual assistant job that you can do from home. You’ll basically be helping busy professionals organize their time and weekly schedules. While working as a virtual assistant, you could make up to 20 or even 30 dollars per hour. Working as a virtual assistant is definitely one of the most lucrative ways to make extra money online while working part time. Click here to find the best and fastest ways to make money! All you need for this is to own a car. Driving with a service like Lyft is one of the most efficient ways to boost your monthly income. People make thousands of dollars per month just by working as part time Lyft drivers. With Lyft, you’ll be your own boss. Feel like working? Just turn on the app and start receiving requests from people who need a ride. Don’t feel like working or already made enough money for the week? Turn off the app and you won’t receive any requests or notifications. It’s one of the fastest ways to make money and it can all be done from the comfort of your car. Click here to get started as a Lyft driver! HealthyWage is an app that’s made to encourage you to lose weight by rewarding you with money. Through the app, you can make bets on how much weight you’ll lose or simply join one of the existing challenges on the app. By winning challenges or bets, you’ll be rewarded with money. You can make up to 10 thousand dollars using HealthyWage. If you ever needed motivation to lose it, this is it. It really doesn’t get better than improving your health while making money in the process. Join HealthyWage now to boost your weight loss! This might seem like a hassle but if you really need the money, opening a new bank account might help with that. You can earn up to $200 when you open a new savings or checking account with certain banks like Citi and HSBC. Some online banks also give you a $200 bonus if you deposit $25,000 or more into a savings account. It won’t work for everyone, but it’s still a viable option. This is different from donating blood. Plasma is the liquid that your blood elements like red blood cells float in. When you donate blood, you donate plasma in addition to blood elements. On the other hand, donating plasma is only donating the liquid while blood elements are returned to your circulation. You can make up to $400 per month just for doing this. There’s no shortage of ways to make free money. All you have to do is look for them. 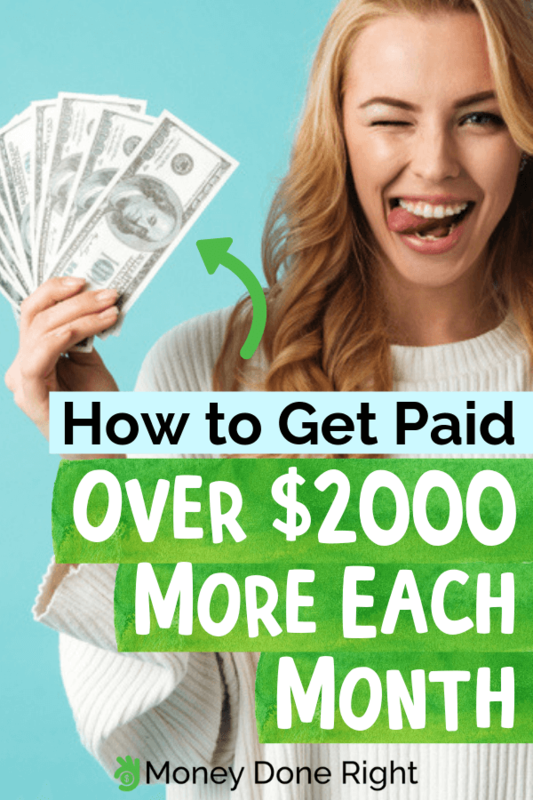 Whether you prefer to take online surveys, shop, write, or sell your stuff, you’ll be able to make those extra $2000 per month with ease and mostly without even having to leave your home.